Club members were regally addressed by David Waller, a member of the Northop Heritage Society, on the significant place in the history of the Dee in transporting arms and salaries to troops in Ireland through the port of Dublin. The Dee provided a convenient base for military expeditions to Ireland. From 1600, substantial numbers of troops, provisions and equipment were sent to Ireland. For example in early 1600, 800 men were transported to Loch Foyle from the Dee. On 16 November 1643, about 2,500 troops (4 regiments of foot and one of horse) landed at Mostyn from Ireland to support the Royalist cause in the Civil War. The Cromwellian invasion of Ireland of 1649-1650 was initially mounted from Milford Haven, but a huge number of sailing vessels were needed to transport troops and their equipment. There were complaints from inhabitants of the Wirral about the rapacious conduct of troops waiting to be transported from the Parkgate area. HMY Mary was the first Royal Yacht of the Royal Navy. She was built in 1660 by the Dutch East India Company. Then she was purchased by the City of Amsterdam and given to King Charles II, on the restoration of the monarchy, as part of the Dutch Gift. She struck rocks off Anglesey in thick fog on 25 March 1675 while en route from Dublin to Chester. Although 39 of 74 crew and passengers managed to get to safety, the wreck quickly broke up. The remains (bronze cannon) were independently discovered by two different diving groups in July 1971. After looters started to remove guns from the site, a rescue operation was organised and the remaining guns and other artefacts were taken to the Merseyside Museums for conservation and display. After the passing of the Protection of Wrecks Act 1973, she was designated as a protected site on 20 January 1974. HMY Royal Escape was a royal yacht used by King Charles II. She was a former coastal trader, a brig named Surprise. King Charles took passage on Surprise after the final defeat of the royalist cause in 1651, narrowly avoiding pursuing Parliamentarian forces. He arrived safely in France, where he lived in exile until the Restoration in 1660. 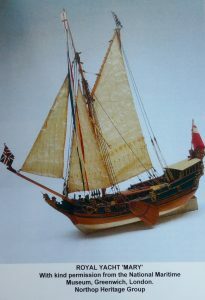 On his return Charles purchased the ship he had travelled on, naming her after his escape from England nearly a decade before. He kept her moored close to his palace, showing her to other royals. The ship remained on the Navy Lists for many years, being sold finally in 1750, though several other vessels perpetuated the name until 1877. Club members were probably more attentive on learning of the mistresses of Charles II – pictures of his ‘harem’ were a welcome end to an interesting topic.